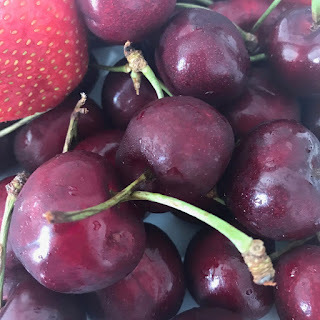 It’s now the British cherry season, which is great as we all love fresh cherries, and there's nothing quite like some juicy cherries which make the perfect snack any time of the day, not only do they taste amazing they are also packed with vitamin C and full of antioxidants including melatonin which helps promote a natural sleep. what better way to start the day in this hot weather than with some cool overnight oats topped with my favourite fresh cherries. Soak your oast overnight to allow them to soften and sweets. 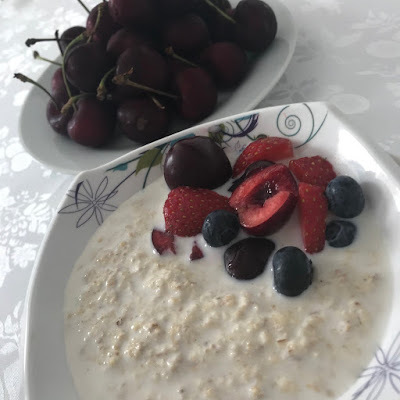 Serve into a bowl with a couple of tablespoons of greek yogurt, add your cherries/berries mixt, I like to use juicy plump cherries with a few blueberries and strawberries. the perfect breakfast for this time of the year, full of cool juicy sweetness. Britain’s cherry season runs from June to September, You can get your hands on a number of varieties that ripen at different times. ‘Mercant’ cherries are available now and can be distinguished by their dark red skin and large size, followed by others including exclusive English variety ‘Penny’, and ‘Kordia’ and ‘Sweetheart’, which ripens towards the end of the season. Legend has it that you can trace the route of old Roman Roads in Britain by looking out for wild cherry trees. It has been suggested that Roman legions spat out the stones from the fruit as they marked through Britain.